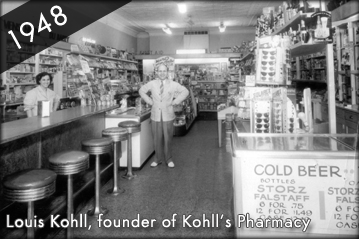 In 1948, Louis and Leona Kohll opened a small pharmacy in Omaha, Nebraska at Leavenworth Street and Park Avenue. Unable to afford employees, the couple managed to keep the store open from early morning until late night seven days a week, depending on their teenage son, Marvin, to deliver prescriptions and run other errands. The Kohll family soon earned the trust and confidence of Omaha physicians and their patients. Personal service and dedication to the health needs of Omaha and vicinity became the hallmark of the pharmacy. Kohll’s Pharmacy and Homecare is a substantially larger and much different endeavor as it observes over 65 years of dedicated service to thousands of people. There are currently eight store locations in Nebraska and Iowa that offer convenient and reliable service, with a total of over 225 employees. Kohll’s Rx only employs the best medical professionals. You are in good hands with our team of professional pharmacists, nurse practitioners, registered nurses, respiratory therapists, and other health therapists who provide daily patient care and expertise.